You can’t blame him, really. The days and nights before competitions are long; sleep is hard to come by. There’s much to worry about: whether the spark plugs are clean, whether the gear ratio will give you the thrust you need, whether the car’s agility is what you imagined it to be. As the team leader of the formula side of Knights Racing, UCF’s Engineering Motorsports club, Hicks will be driving the team’s car this morning. 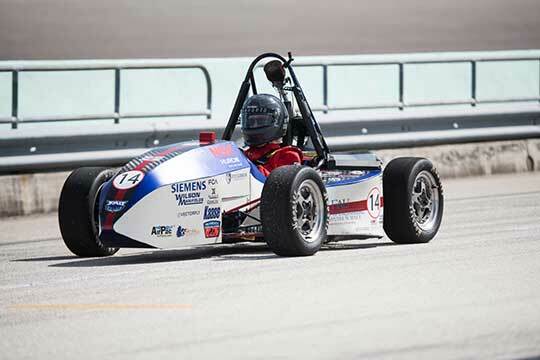 It’s a Friday in early August, and he and his team are in Homestead, Florida, competing in a Society of Automotive Engineers (SAE) invitational against Florida Atlantic University and Florida International University. It’s a relatively low-key event — friendly and almost quiet, taking place in an empty speedway that smells of sunblock, gasoline and burnt rubber — unlike the larger, more strenuous national competition in Michigan they’ll compete in next May, the prize they have their eyes on. In between events, Hicks is often slumped over, his orange racing suit unzipped in the morning heat, resting in the shade, gulping bottled water and pushing his hair out of his face. He’s calm and focused, occasionally laughing and joking with his teammates, then returning his attention to the car. Today, they’re testing acceleration, maneuverability and handling. A few minutes before the acceleration test, Hicks jumps in the UCF team’s car, which is smaller than you’re probably imagining, almost resembling a souped-up go-kart, only faster and louder and plastered with sponsor stickers. He turns the ignition, but the car doesn’t start. Hicks jumps out and begins sorting out what’s wrong — but time isn’t his friend. The event is supposed to start in mere moments. With the clock ticking down, he and his teammates finally arrive at an answer: a sensor was dislodged, and the spark plugs got wet. But an answer isn’t a solution; they’ll have to MacGyver something, using only what’s around them. A team member grabs a water bottle and quickly cuts the bottom half off. Hicks places the spark plugs in it while he frantically uses a toothbrush to clean them. Then he lets the plugs dry in the warm morning sun. A few minutes later, and just in time, he replaces them and the car is ready to go. Now, wide awake, Hicks jumps in and drives the car to the starting line. There, he revs the engine, a loud, piercing roar, and then floors it. It’s over in a few seconds — 4.76 seconds, to be precise, a half-second behind the victorious FAU. “The car actually did really well,” Hicks says. The team was able to predict its performance almost exactly, within two percent, and the car dominated in the handling event. 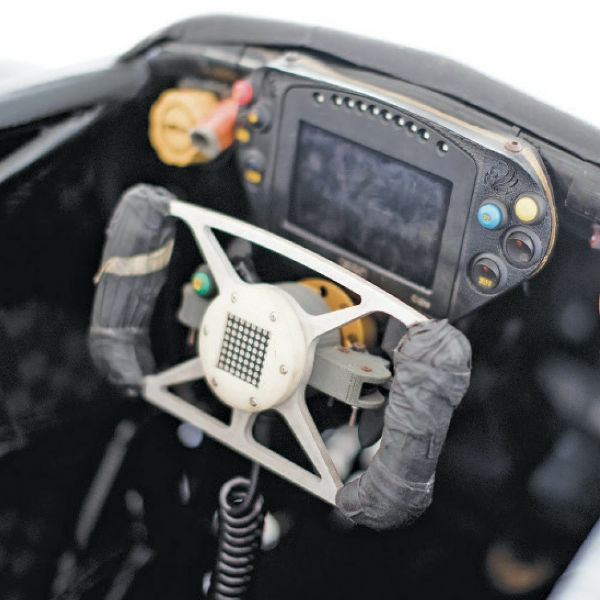 But he’s racing last year’s car — and every year, the team designs a new one, if not from scratch then with large chunks of new material, using the previous model to figure out what to do better. The design for this year’s car is already underway. Over the fall and winter, it will be welded into place. “We’ll fall in love on Valentine’s Day,” he says. Hicks grew up around cars, as did many members of the UCF formula team. His father owned a Sprint Cup car years ago. 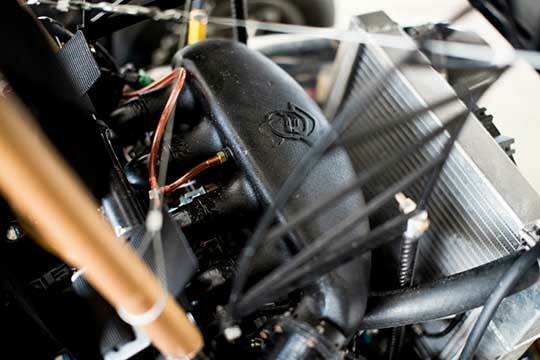 When he and his twin brother, Harley — who is also on the Knights Racing formula team — turned 16, they both got manual V-8s and began tinkering with them. The brothers came to UCF to study engineering. 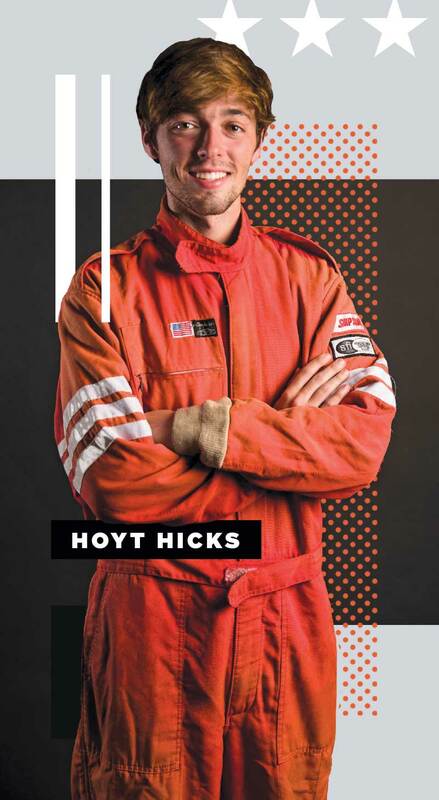 Hicks says he knew immediately that he wanted to get involved with SAE, both because he loves cars and because SAE offers an almost unassailable gateway to the automotive profession. At first, he found the formula side disorganized, the result of a team who had all graduated at once. In his first year with Knights Racing, 2015–16, everything broke. 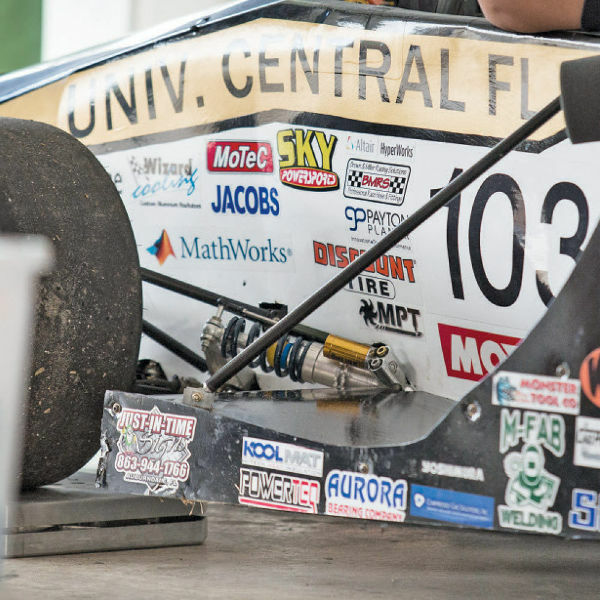 But fixing things — finding a better way to do something — is why many students join Knights Racing in the first place. And so the second year, that’s exactly what they did. 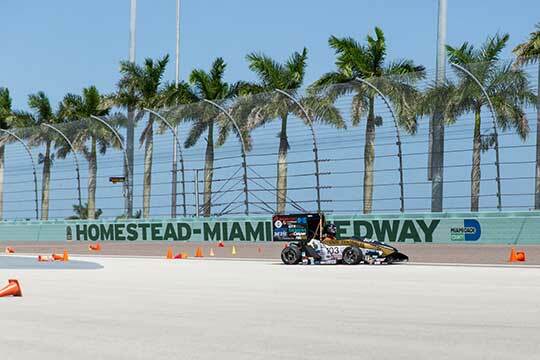 They scrapped the old design and started over, building the car they raced at Homestead. They saw a substantial improvement, but it still wasn’t good enough. For this year’s car, they’ll build a new frame, finish the car earlier and take more time testing it. Hicks is hopeful they’ll have more success in Michigan, where they finished 59th out of 109 teams last year. That’s true on the Baja side of Knights Racing as well. 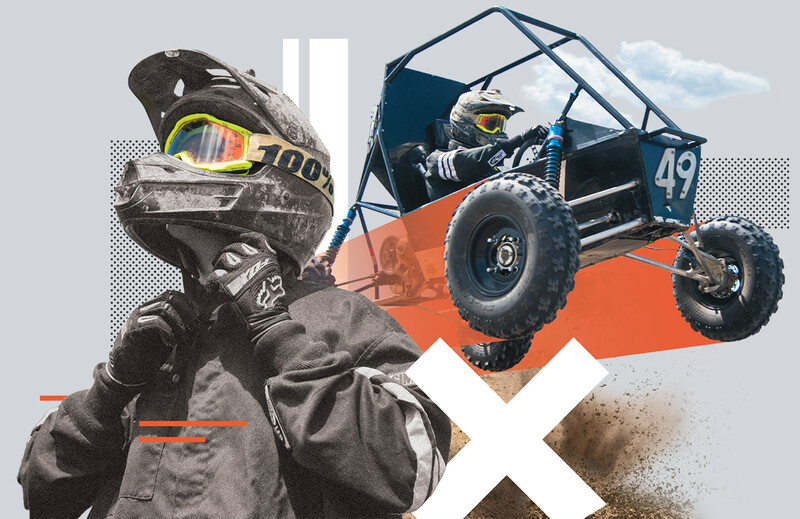 The Baja team — which races off-road — has a longer and much more storied history than the formula team does. 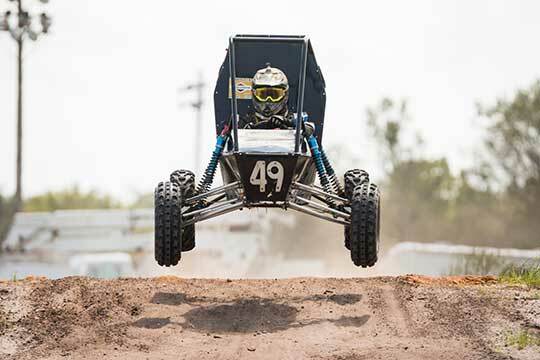 While the formula team began in 2000, the Baja team has been around since the 1970s, and for a time was one of the top Baja teams in the country. UCF, in fact, hosted the annual competition several times between 1978 and 1996. 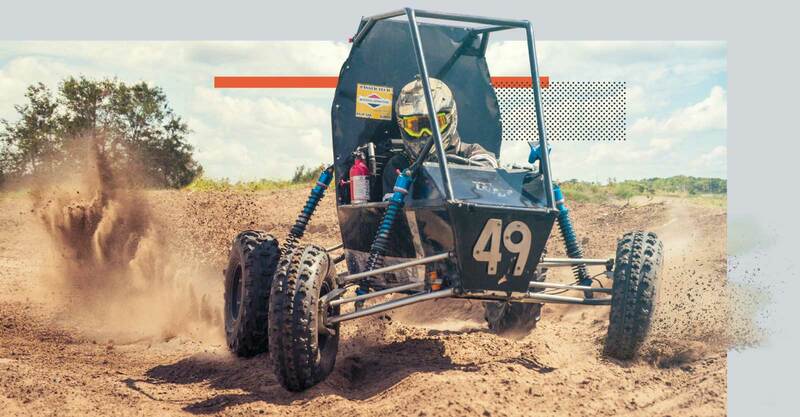 That last year, 1996, the Baja team came in second at the Mini Baja East competition, recalls Donald Minderman ’88, a former Baja team leader who has worked for NASA ever since graduating. Vicente Porcar, the current Baja team leader, wants to recapture that former glory. A few years ago, the Baja team was in a tough spot. In 2014, the team competed in national events but didn’t perform particularly well. In 2015, Wyatt Brooks’ first year, things stayed about the same; UCF was ranked somewhere in the middle of the national pack. But the next year, “the car came together really well,” Brooks says. The team finished 32nd at the national competition — a big improvement, especially considering that the team made some mistakes during the event. “We already built a top-20 car,” Brooks says. Melissa Tropeano has her own goal for 2017: to make Knights Racing a little less of a boys’ club. She’s the club’s public relations lead, which means she’s in charge of — among other things — handling social media, arranging must-have sponsorships and recruiting new members. Tropeano, too, grew up around cars; her father owns a repair and restoration shop. A sophomore, she spent her first year on the team learning the basics. This year, she’s more involved, learning how to weld and mill. Eventually, she says, she wants to land a job on a Formula One team. That’s not a pipe dream. 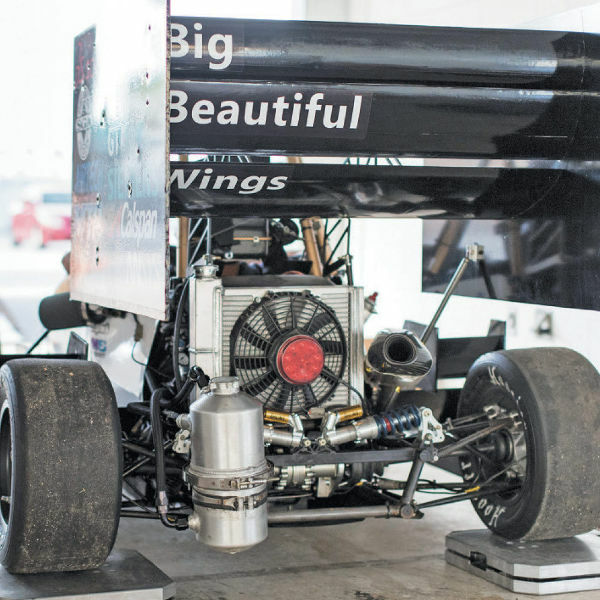 Talk with a dozen or so current and former Knights Racing members, and a central theme emerges: SAE opens doors to many engineering and car-related jobs, including Altec and General Motors. 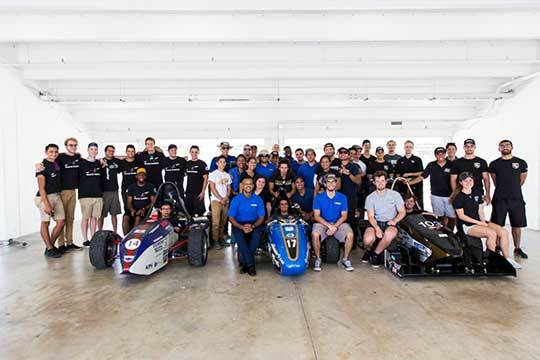 In fact, nearly all of the club’s active members get jobs within a few months, and the graduates often credit Knights Racing with their success. Minderman, now a construction chief for Kennedy Space Center, says being president ofKnights Racing helped land him a job at NASA despite mediocre grades. 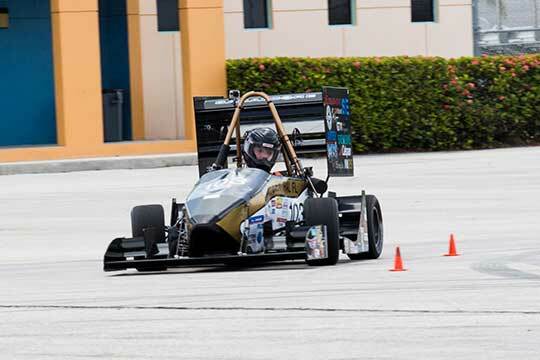 Participation in Knights Racing demonstrates both of those elements: passion, in that the students dedicate 25 hours a week or more to their cars; and experience, because they’ve progressed beyond the theories that they’re taught in class and learned how to apply practical engineering. But that’s only part of why they’re here, why they devote so much of themselves to not just building and maintaining these cars, but also to seemingly endless fundraising. 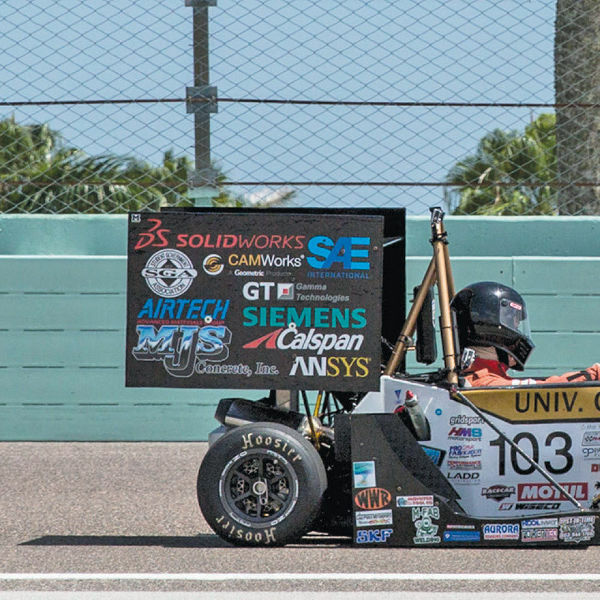 After all, even though Knights Racing does receive some funding from the Student Government Association, it doesn’t cover the full cost to build a car. Members have to be scrappy, selling concessions at Daytona International Speedway and making deals with manufacturers for parts. And, sure, they’re competitive, but it’s not like they’re in it for glory. No, what keeps them in the shop is something else. For some, cars are in their blood. They couldn’t not do this if they tried. But for all of them, the camaraderie — the sense of fraternity that extends into the SAE professional world — is what really matters. It’s why Hoyt Hicks and the rest of the Knights Racing team regularly push through their exhaustion. That, and the thrill of figuring out how to fix whatever might be broken. coefficient of lift and 1.3 coefficient of drag. This car could drive upside down in a tunnel at 70 mph.